Today I present the latest evidence of what has now become a sixteen-year investigation into the life and crimes of my father, Dr. George Hill Hodel. 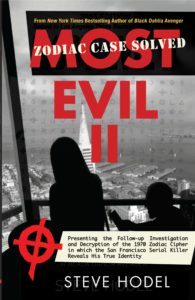 Most Evil II is my fourth book. Four books, but one investigation and one suspect. As the LADA secret police files and the hard evidence and forensics continued to build over the years, most have become convinced, “beyond a reasonable doubt.” Most recognize what law enforcement knew back then–that George Hodel was in truth the “Black Dahlia Avenger.” That he was LA’s 1940s “Lone Woman Murderer,” and had sadistically slain a dozen women and taunted the police with his “catch me if you can” crime scene notes and mailings. With the discovery of the LADA secret Hodel Black Dahlia Files, I was led into, darker deeper waters. As I continued to examine those original 1940s secret police files, I discovered that not only did they confirm, that Elizabeth Short, the “Black Dahlia,” had known and been a girlfriend of George Hodel, but, more. They revealed that in 1946 (while George Hodel was temporarily doctoring for the United Nations in China) Elizabeth had traveled to Chicago. Why? Official reports suggest her reason had been to obtain information on the recently headlined, “Lipstick Murders”; three horrific, sadistic killings that had been committed in Chicago in the months immediately prior to George Hodel leaving the country. 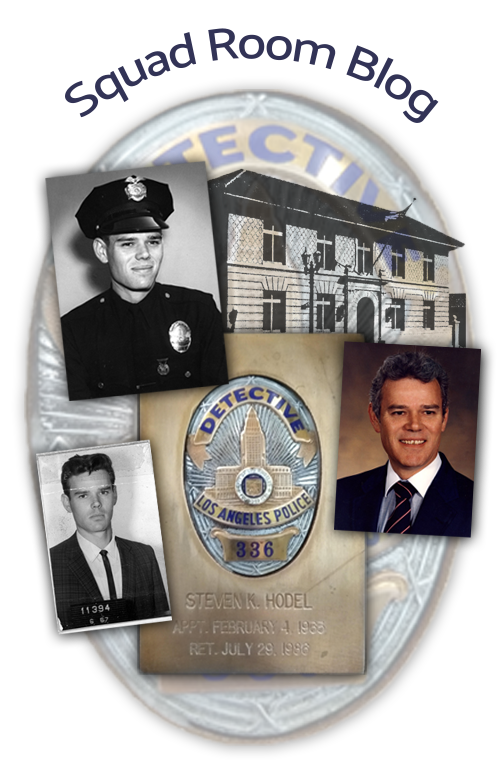 While I believe I had made a “compelling case” that George Hodel could very well have committed the San Francisco crimes and reinvented himself from “Avenger” in the 1940s to “Zodiac” in the 1960s, I also knew, unlike the LA serial killings, I had not “made my case.” The known evidence while compelling still remained–circumstantial. Now, six years later, I present that follow-up Investigation to that book, along with a new claim. Speaking as a veteran homicide detective with forty-six years experience, it is now my considered professional opinion that Dr. George Hill Hodel was, in fact, the San Francisco serial killer known as ZODIAC. Further, the solving of the known 1970 Zodiac cipher, as presented here for the first time, is George Hodel’s signed admission and confession to having committed those crimes. Throughout these many years, you, my readers, have always remained the triers of fact–my jury. I ask you once again to resume that role and dispassionately review the new evidence and judge for yourself. See Rare Bird Books MOST EVIL II Publication Announcement and currently scheduled Author Talks – HERE. Just as I was closing down my computer, it happened. Have you ever noticed that Zodiac’s signature was acompound of two ogham “letters”? The letter on the leftside is for “H” and the letter on the right side is for “L.” The Irish name of the first “letter” is “beithe,” that means “flash,” “flame,” and the other is called “uath,” the old-Irish word for “scare.” The dots remain mysterious. Note- *Many readers will recall that after the US military and intelligence experts were unable to solve Zodiac’s original 1969 three-part cryptogram, a married couple, Donald and Bettye Harden,“cracked the code” after studying it for just one weekend. Their solution was confirmed by the Vallejo Police Department and published in the San Francisco newspapers. Donald Harden, like Yves Person, was also a high school teacher. Harden taught history and economics at North Salinas High School in Salinas, California. Where can I find this in the la basin? Must read immediately! Amazon had a few copies available for about a day and now has Most Evil II listed as a pre-order. Abebooks and Alibris appear to have available copies. It will be worth the wait, but hopefully it arrives quickly! I can’t wait to read this new book. I just ordered it from Amazon. Steve, I would still like you to present at our annual homicide conference. This makes it more inviting. I will buy martinis. Congratulations. Once again you have brought six more years of insight and information to culmination. You are an amazing, dogged, intrepid investigator/detective! It is so very difficult to stay on the trail for so long without muddying the water. Your methods are demonstrably curious, objective, fact-based, and accurate. MEII is a great read with one hell-of-a conclusion! A conclusion with which I agree! Will your book be available in the Kindle format? Yes, it will be available. Hopefully, fairly soon, and followed by an audible format within the next few months. Amazon and Barnes & Noble say the paperback publication date is September 29. However, nothing is mentioned about a Kindle or Nook edition. Do you know if these versions will be made available? Looking forward to reading. Nice offer from the publisher! Just ordered your latest book through your publisher and can’t wait to read it. I have read the first 3 and totally believe you have solved these “cold cases”. What concerns me most is what impact all of your research and discoveries have on you and the psyches of all of your family? It has to be devastating to find that your father was a monster in every sense of the word. How do you reconcile yourself to realize that what he did has no barring on you or your family? Please tell me to mind my own business if what I wonder is too personal for you to answer! Thanks, and keep on fighting the good fight. You give hope to many people that someday someone may solve a crime involving their loved ones. Just finished reading ME II. Thanks once again for digging and digging until the truth is finally revealed. If only we were all so tenacious. Do you still plan on publishing a book on your father’s early years as a serial killer? Hi Ryan: Thanks for the kind words. Yes. After I decompress for a bit, I will resume my pursuit of ferreting out the crimes fro his “Early Years.” Every time I begin to pursue something comes along to divert my headlights. First it was Most Evil, then BDA II and then Most Evil II. Frustrating, but it is only after I completed those investigations that I could see how they were needed to be done before pursuing the final book. Steve-Just recently discovered this amazing (and disturbing) series, and have a question: Do BD AVENGER II and MOST EVIL II reprint the entirety of the first volumes? Thank you, I’ll be reading. Wow. I tell this story to anyone that will listen. Just reread “Most Evil” because that’s where I lose the most people. The Zodiac angle leaves most people in the dust. It’s all there, though. I’m going to now order “Most Evil 2”. I live at Normandie and Melrose and can’t resist looking at your old house when I drive by Franklin and Normandie. I want you to know I respect what you have done and I believe you. This couldn’t have been easy. Thank you for standing up for the victims and setting this story to paper so eloquently. Hi Jo. Thanks for the kind words. Much appreciated. I think you will find in reading ME II how it all comes together and validates his personal madness and crime signature as, “Murder as a Fine Art” theme. All my best, Steve. What did the police and investigators said about your evidence proved in your books? Is there any official development in the case thanks to you? Richard: LAPD’s “official” position is “they don’t have time to review the investigation due to needing to attempt to solve more recent cases.” That said, four of LA’s top brass in LE (LAPD Chiefs Parker and Thad Brown, DA Lt. Frank Jemison, Undersheriff James Downey) all privately and independently confirmed back then that the “case was solved and the killer was Dr. George Hill Hodel.” Subsequent to my publication, both Head DDA Steve Kay and then active LAPD Chief of Detectives, James MacMurray declared “case solved” and Chief MacMurray ordered his detectives to “Go ahead and clear the case.” (His order was ignored by detectives, knowing he would retire in 9 months.) In regards to the Northern California Zodiac investigation I have offered to personally present the “new evidence” but so far as indicated in Most Evil II, none of the LE agencies are open to hearing it and no confirmed DNA evidence on Zodiac has yet been obtained by LE. California DOJ (Dept of Justice) handwriting expert has reviewed George Hodel’s handwriting and stated, “I am unable to eliminate Dr. Hodel’s handwriting as being “Zodiac” but unable to confirm authorship without additional “lower case HW samples”. (So far they are non-existent, as my father normally wrote in upper case.) Regards, skh. Hello. I wanted to write a bit of information regarding the ogham characters. The name of the first ogham character is Beithe, which refers to the letter “B”. The character shown on the right IS the letter L and does mean flame or herb, as well as having other meanings related to cattle — but it’s name is Luis not Beithe, (The ogham characters in order begin BLFSN and are called the Beith-luis-nin; this word’s construction compares to our own word, derived from the Greek, for our collective letters, alphabet — alpha, beta). Also, wanted to add to Monsieur Person’s meaning for the character H (on the left), which means horror as well as fear. There is also the Ogham of Bricrenn wherein dots represent the 20 characters of the Beith-luis-nin. (This code was named for a brilliant but trouble mongering poet named Briciu.) But perhaps the dots are Morse Code. Four dots do represent H, and one dot is the E.
The symbol used for the Zodiac is reminiscent of the wheel ogham of Roigne Roscadach, though the crossed lines do not extend beyond the circumference of the circle. I was interested in the seemingly rare occurrence of ten suicides within a three day period mentioned in “Black Dahlia Avenger” (2015) which events included the suicide of Ruth Spalding, the surrender of Nazi Germany, and the reappearance of Elizabeth Short in L.A. I wondered about the suicides in conjunction with your father’s interest in poisons, which you pointed out earlier in this book as a notation in his 1943 calendar, Were any of the other suicides by overdose, or connected to your father or his close associates? Perhaps you revisited this unusual cluster of suicides in a later edition I have yet to read and you can direct me to it. One other question that may require similar direction is on the subject of your father’s secretaries and that is: What became of Marion Keyes? p.s. Re. Marion Keyes, remarkably after marrying and moving to the Great Northwest she lived to the age of 105! Had no idea she was still alive when the book published, so never made contact with her. Wished I’d known she was still living. What an interview that would have been.